poor showing against Lithuania drew merciless criticism from the Italian press, with comments like: "Italy, has come down to earth". The success in football was for Lithuania’s sports fans compensation for the Lithuanian basketball team not living up to expectations in the recent World Basketball Championship in Saitama, Japan, when they finished with 7th place, instead of the hoped for medal. In the World Basketball Championship, Lithuania lost the first two matches against Turkey and Greece, but then went on to win the next four matches against Qatar, Australia’s Boomers, Brazil and Italy. 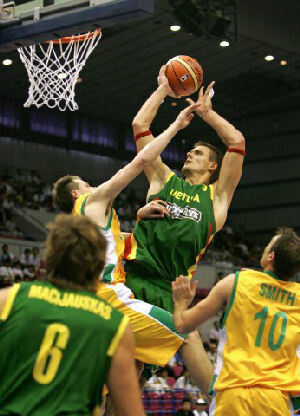 The defeat of Italy (71:68) allowed Lithuania to progress to the quarter finals, in a match which some fans saw as revenge for Italy having knocked Lithuania out of a previous basketball championship. Lithuania then lost disastrously to Spain, the eventual world champions, and Turkey, but won their last game against Germany to secure 7th place. For their next Euro 2008 qualifying round match Lithuania played the Group B leaders Scotland last Wednesday, September 6, on home ground at the Darius & Girėnas stadium in Kaunas. Over three thousand Scottish fans came to Lithuania for this event. Lithuania lost to Scotland (1:2), for the first time on home ground. The goal for Lithuania was beautifully scored by Darius Miceika executing a spectacular backwards summersault. In earlier matches against Scotland on home ground, Lithuania had drawn (0:0) in 1998 and won (1:0) in 2003, while playing in Scotland it lost to Scotland both times, (0:3) in 1998 and (0:1) in 2003.